ABU DHABI: Pope Francis met with Sheikh Ahmed Al-Tayeb, the imam of Al-Azhar, and Emirati leaders on Monday during his historic visit to the United Arab Emirates. In a trip laden with interfaith symbolism and messages of religious tolerance, the Pope began his day at the Presidential Palace in Abu Dhabi and ended with the signing of an agreement pledging to make efforts to strive for peace. The day’s tour of key locations in Abu Dhabi, both religious and political, marked the end of a two-day conference – the Human Fraternity Meeting – in which religious leaders from many faiths, both Abrahamic and non-Abrahamic discussed the importance of tolerance. At the end of the day - giving thanks to his hosts, Pope Francis said: "I have welcomed the opportunity to come here as a believer thirsting for peace, as a brother seeking peace with the brethren. 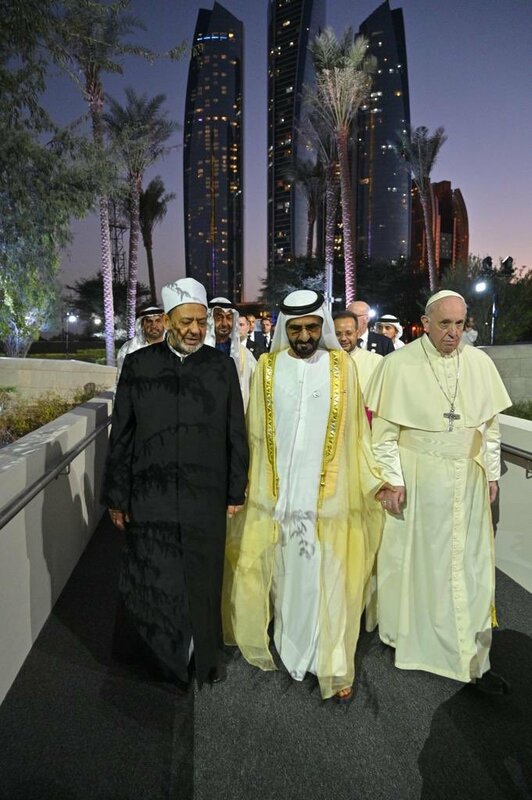 UAE today was proud to host the historic meeting of His Holiness Pope Francis and His Eminence Dr. Ahmad Al Tayeb. We launched the 'Human Fraternity Award' to create a true interfaith dialogue. The two religious symbols were honoured during the award's first edition. Pope Francis also urged religious leadersto work together to reject war and strongly denounced violence committed in God's name. The Human Fraternity Meeting wasalso attended by Sheikh Ahmed El-Tayeb, the Grand Imam of Egypt’s Al-Azhar mosque and university, and he called on Muslims in the Middle East to "embrace" local Christian communities. He addressed Muslims saying: "Continue to embrace your brothers the Christian citizens everywhere, for they are our partners in our nation," he said during thetelevised speech from theceremony in the United Arab Emirates capital Abu Dhabi. Then he addressed Christians saying: "You are part of this nation. You are citizens, you are not a minority.. You are citizens with full rights and responsibilities." Sheikh Tayeb also called on Muslims in the west to integrate in their host nations and respect local laws. Pope Francis and Sheikh Tayebsignedthe Human Fraternity Document during the ceremony, and they were presented with the inaugural Human Fraternity Award for their efforts to spread international peace. Earlier at the Presidential Palace he was met by Sheikh Mohammed bin Zayed, Crown Prince of Abu Dhabi and Deputy Supreme Commander of the UAE Armed Forces and Sheikh Mohammed Bin Rashid Al-Maktoum vice president and prime minister of the UAE. Soldiers marched to the square inside the presidential palace grounds, led by a military band. A fly past saw jet planes leaving a trail of white and yellow smoke – the colors of the Vatican’s flag - and in the background the thundering noise of a 21-gun salute could be heard echoing from behind the palace buildings. They stood for the national anthems and then the Pope was introduced to members of the UAE government. Then it was the turn of members of the Vatican to shake hands with the two Emirati leaders. The Pontiff was then taken in a simple Kia car to the Sheikh Zayed Grand Mosque in Abu Dhabi where he and Sheikh Ahmed Al-Tayeb met the Muslim Council of Elders. It was a short visit and within an hour the convoy of Emirati and Vatican staff and security drove to the final and most significant part of the day which was at the Founder’s Memorial, a tribute to the UAE's founding father, Sheikh Zayed bin Sultan Al Nahyan. "We discussed enhancing cooperation, consolidating dialogue, tolerance, human coexistence and important initiatives to achieve peace, stability and development for peoples and societies,” he tweeted. The pontiff offered the crown prince a framed medallion of the meeting between St. Francis Assisi – the pope’s namesake – and the Sultan of Egypt Malek al-Kamel, in 1219. Sheikh Mohammed, in turn, offered a deed for the plot of land on which the first church in the UAE was built.